Shamika is a Tech Chaplain inspired by #technowomanism. She grew up in San Antonio and was blessed to obtain an interdisciplinary degree in the humanities from Stanford University. After moving to New York initially to serve with AmeriCorps, Shamika is now looking to provide direct service in the digital space. 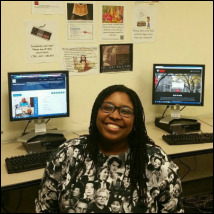 With all of her digital hats, she works to empower people and places of faith around technology and is a candidate for the Master of Divinity at Union Theological Seminary in the city of New York.